Magtech ammunition is produced on modern remote-controlled assembly lines by a Brazilian defense contractor using internally sourced primers, propellants, and casings. 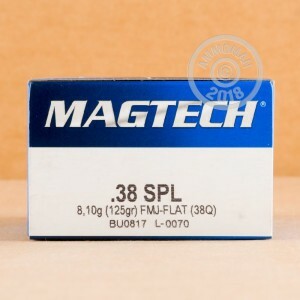 Magtech's .38 Special rounds are a great choice for range use in a .38 Special or .357 Magnum revolver. 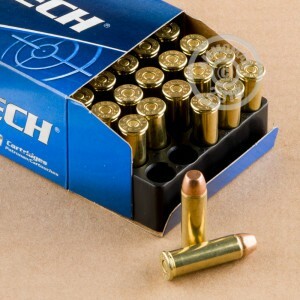 Packaged in a 1,000 round case containing 20 boxes of 50 rounds each, these cartridges use a 125 grain full metal jacket bullet, non-corrosive Boxer primers, and reloadable brass cases. The flat-nosed bullet profile makes better holes for improved target shooting feedback, much like a semi wadcutter. Make a purchase of over $99 at AmmoMan.com to qualify for free shipping and handling!